Our love for all things Cajun just doesn't stop and today we see the return of the Cajun Dance Party! Come by all afternoon for Cajun music and dancing, grab a few drinks, and let your spirit soar to heart of New Orleans. 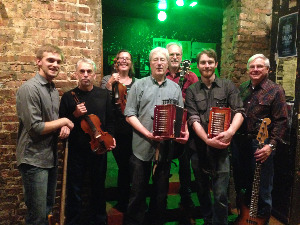 THE CHICAGO CAJUN ALL-STARS play traditional Cajun waltzes and two-steps with real gusto and zeal. Double fiddles, Cajun accordion, guitar, bass and drums energize the dance floor. Playing with a nod to French Louisiana, all songs are sung in Cajun French. The members of the band are widely known outside of Chicago, having played and jammed with many Southwest Louisiana Cajun and Creole musicians. These all stars bring the heart of Cajun life to the dance hall!